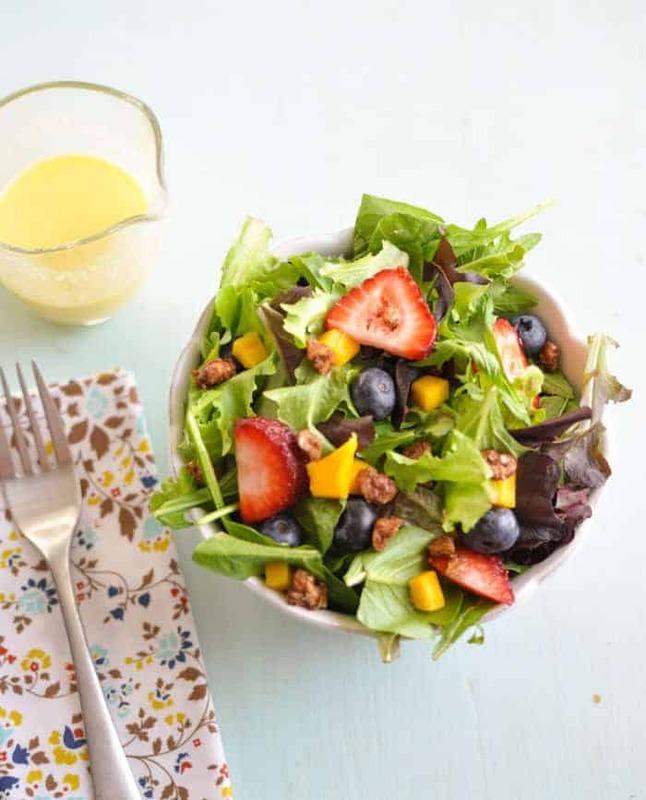 This Mixed Greens with Mango, Berries and Mango Salad Dressing is the perfect summer salad, so if it’s summer – or if you just miss summer – you can whip this up in no time can enjoy the light, refreshing mango, strawberries and blueberries topped with a mango salad dressing. Oh, and don’t forget the best part – the maple candied pecans! I was looking over my monthly calendar and realized that school starts in a few weeks for my children. I don’t know why, but it seems like when school starts, summer is over. I know that we will have a few more weeks of hot weather after school starts, and that summer isn’t technically over for a little bit…but going back to school means structure, bedtimes, organization, etc. It takes away some of the summertime spirit. Anyways (I do have a point), after I realized that summer is slipping away, I needed to get as much of it in as I can, including eating as much “summer’ as I can these next few weeks. Which is why I am posting this salad recipe. Mango salad dressing one of my favorite summertime dressings. It is super-easy to throw together and is great to serve to a crowd. I take it to get-togethers all the time, and it always gets devoured…and I can add some diced or shredded chicken to it, and make it an entire meal. I got the inspiration for this salad from a local cafe. I always order it when I go there, and frequently crave it. One day, when I was having an especially strong craving but was feeling too unmotivated and cheap to take my two kids there to get one, I thought…I will just recreate it at home. 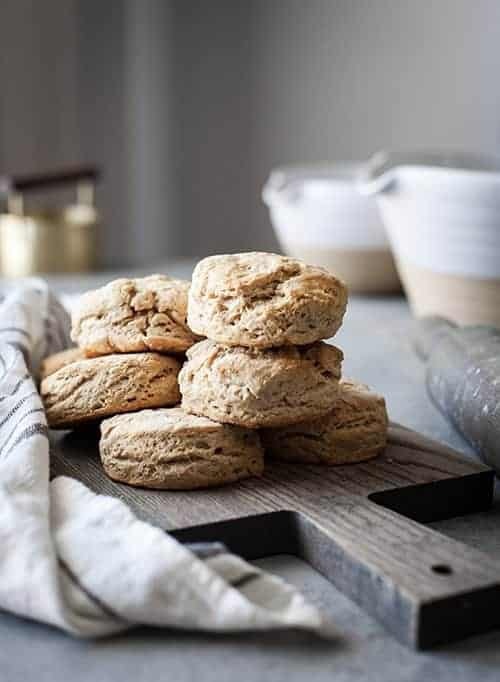 I am so glad that I did, because now I make it all the time, and like I mentioned above…It is my go-to potluck item to take to BBQs and get-togethers during the summer. 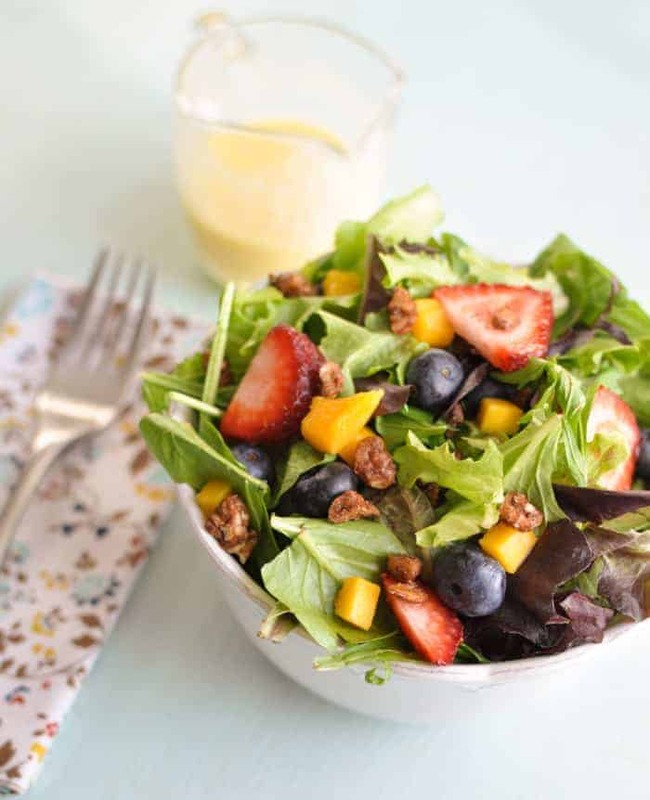 The berries and mango coupled with the maple candied pecans are like a match made in heaven, and the creamy yogurt mango dressing is a sweet and tangy topping, that makes the entire bowl irresistible and downright addicting. I have been known to take two large bowls to social events and polish off one of the bowls by myself. I, of course, try to do it tactfully by only taking a plateful at a time, and inconspicuously going back for seconds and thirds :). Do you feel like the summer “spirit” is gone once school starts? I would love to know if you try my mango salad dressing recipe and what you think of it. Please comment below! 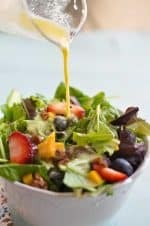 I love this light, refreshing Clean Eating green salad with mango salad dressing. It is the perfect compliment to pretty much any healthy meal. Oh, and don’t forget the best part – the maple candied pecans! Add water, one Tbsp at a time, until desired consistency is reached.